The Student Activities Board will host spring comedians Andrew Schultz, Jamie Lee and Carly Aquilino from MTV’s “Girl Code” and “Guy Code” at 7 p.m. April 11 in Baldwin Hall. Doors will open at 6:30 p.m. The event is free for students and $5 for general admission. Tickets can be picked up at the SAB Office in the Student Union Building from 9:30 a.m. to 3:30 p.m. Monday through Friday. General admission can also buy their tickets on the SAB website. MTV’s “Girl Code” and “Guy Code” are strong and smart comedy series bringing millennial viewers a new, hilarious how-to manual full of over-the-top tips to push the envelope and open the dialogue about the wonders and woes of men and women. Andrew, Jamie and Carly are all current cast members of the show and will be performing their own stand-up as well as taking questions from the audience. The Girl Code/Guy Code panel was the Truman students’ first choice last Fall on SAB’s Big Entertainment Survey, with 48.6 percent of the vote. For more information, contact Hannah Litwiller or Caity Biberdorf at comfi.sab@gmail.com or 660.785.4722. 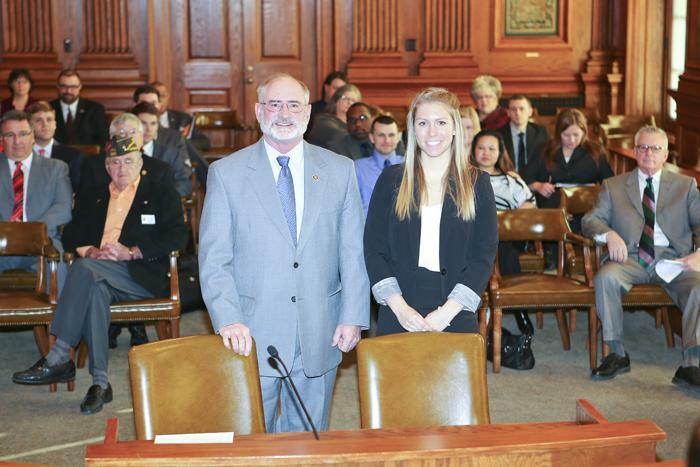 Kelly Kochanski of St. Louis was appointed as the student representative to the Truman Board of Governors by Gov. Jay Nixon, Feb. 14 and confirmed by the Missouri Senate, March 26. She is an exercise science major with a psychology and biology double minor. Kochanski is a member of Alpha Phi Omega, a national coeducational service fraternity, and has been active as a volunteer in numerous charitable and church organizations in both high school and college. Kelly Kochanski stands with Sen. Brian Munzlinger at her Gubernatorial Appointments Committee hearing in Jefferson City, Mo. Other schools on the list include the University of North Carolina at Chapel Hill, the College of William & Mary and the University of California, Berkley. Truman’s spot on this list comes on the heels of being listed as the No. 9 “Best Value College” by the Princeton Review and the No. 3 “Best College Value Under $30,000 a Year” and “Best College Value in the Midwest” by Kiplinger’s Personal Finance. To read the Business Insider’s full article, click here. Herman Edwards, the former head coach of the Kansas City Chiefs, and current NFL analyst for ESPN, will visit Truman April 12 as part of the Holman Family Distinguished Speakers Series. Passionate, enthusiastic, motivational and energetic are all words used to describe Edwards. Although most know him for his time as a successful former NFL player, NFL coach and current in-studio NFL analyst for ESPN, Edwards is also known for being a positive role model and using motivation as a tool for a call to action. Edwards will take the stage at 8 p.m. April 12 in Baldwin Hall Auditorium to talk about the need to create a life plan, the importance of service and giving back to your community and having integrity in everything you do. Edward’s will talk about how we are a collection of our choices and we must set goals and then have a plan of action to accomplish those goals. Edwards and his wife Lia are involved in numerous charitable efforts and philanthropic endeavors in their home base of Kansas City, including the Juvenile Diabetes Research Foundation and the Boys and Girls Clubs. Edwards was named Big Brother of the Year by the Catholic Big Brothers for Boys and Girls in New York, and he has also participated in the All Pro Dad initiative, a parenting program that has received national recognition. In 1985, he founded the Herm Edwards Youth Foundation, and in May 2011, he brought The Herm Edwards Youth Football Camp to Kansas City. Edwards started his career in the NFL with a 10-year professional playing career from 1977-1986. The first nine of those seasons were with the Philadelphia Eagles. In 1980 his role on the defense earned him All-NFC honors and helped boost the team to a berth in Super Bowl XV. Following his playing career, Edwards coached defensive backs at the collegiate level. From 1992-1994 he coached defensive backs with the Kansas City Chiefs, and spent an additional year as a pro personnel scout with the team before joining coach Tony Dungy’s staff in Tampa Bay in 1996. In 2001, Edwards departed Tampa Bay to become the head coach of the New York Jets. He led the team to the postseason in his first campaign with the squad, and would be on the sideline for a total of five playoff contests with the team. Edwards returned to Kansas City in 2006, this time as the head coach. He would repeat the success he had with the Jets, taking the Chiefs to the playoffs in their first season under his leadership. In 2013, Edwards joined elite company as a recipient of the Walter Camp Man of the Year Award. Other notable marks in his career include speaking at the NFL Rookie Symposium and being featured on ESPN’s “Back to School” segment in which he returned to his high school alma mater to coach for a day. Most recently, Edwards was named the Team ESPN 2013 Commentator of the Year. Complimentary tickets for this event may be picked up at Truman’s Information Desk or the Student Activities Board Office, both located in the Student Union Building. Tickets may also be picked up in the Public Relations Office, McClain Hall 202, or at Edna Cambells in downtown Kirksville. For more information, contact pr@truman.edu or call 660.785.4016. His visit to Truman is sponsored by the Holman Family Distinguished Speakers Series Endowment. Performances will take place at 8 p.m. April 9-12 in the James G. Severns Theatre in Ophelia Parrish. Tickets are $5 and can be purchased in advance at the Box Office or by calling 660.785.4515. Arriving on Broadway in 2009, “Next to Normal” caught the eye of critics and audiences with its unique book and music by Tom Kitt and Brian Yorkey. The musical received 11 Tony Award nominations and captured three wins, while also winning the Pulitzer Prize for Drama, making it the eighth musical in history to receive this award. “Next to Normal” is a contemporary family drama about a woman’s struggle with mental illness and the effects of her illness on her family. At first, Diana (played by junior Bailey Jones) seems to have an ideal life, but it soon becomes clear that all is not as it seems. Diana has bipolar disorder and her symptoms—anxiety, mood swings, and hallucinations—are growing worse with time. Diana takes medication, talks through her problems with a psychiatrist (sophomore Tom Martin) and undergoes the more controversial treatment of electroconvulsive therapy. Meanwhile, her husband Dan (junior Christian Wacker) confronts his own confusion and depression, while her daughter Natalie (junior Maddie Chambers) deals with isolation and a budding romance with a fellow music student, Henry (sophomore Alex Heberlein). Diana’s son Gabe (junior Keaton Richey) serves as her confidante and link to a happier past. Although the family strives to establish some sort of normalcy, the ties that bind slowly and inexorably unravel around them. The show contains strong language and adult themes and is not recommended for children under 13. The Truman Children’s Literature Festival will take place from 9 a.m.-2:15 p.m. April 4 in the Student Union Building for almost 1,400 fourth-, fifth- and sixth-grade students. Visiting authors and illustrators include Leslie Bulion, Frances O’Roark Dowell, Lisa Campbell Ernst, Kelly Milner Halls, Katherine Hannigan, Kenn Nesbitt, Sara Pennypacker, Ginny Rorby, Amy Timberlake, Linda Urban and Jacqueline West. Students will participate in 30-minute sessions with the guest authors and illustrators. All children attending must be pre-registered. The authors’ books are available at the Truman State University Bookstore. University faculty, staff, students and other interested adults are welcome at any of the sessions. To register, contact Daisy Rearick at drearick@truman.edu or call 660.785.4048. Anyone interested is welcome to attend an informal meeting and book signing with the authors and illustrators from 3-4 p.m. in the Student Union Building Conference Room (SUB 3000). Refreshments will be served. The festival will conclude with a dinner at 6 p.m. in the Student Union Building Activities Room (SUB 3200). The dinner is limited to pre-registered adults and children accompanied by an adult. The cost of the dinner is $11. To register, contact Rearick at 660.785.4048. At 7 p.m. author Sara Pennypacker will give a presentation. The Children’s Literature Festival was an annual event for 21 years. Due to severe budget cuts the festival was discontinued in 2004. A Children’s Literature Festival Fund was established in 2007 in an effort to bring the Festival back, and it did return in 2009. For more information about the fund, contact the Office of Advancement at 660.785.4133 or visit giving.truman.edu/SpecialInitiatives/ChildrensLiteratureFestival.asp. The festival is sponsored by Pickler Memorial Library with financial support from the Freeman Foundation, Follett Higher Education Group—Truman State University Bookstore and the Truman State University Foundation. Additional information may be obtained from Sharon Hackney (660.785.7366 or shackney@truman.edu) and the Children’s Literature Festival. Truman’s Phi Kappa Tau chapter will be conducting its 19th Annual Cookout for Kids April 15 to benefit the SeriousFun Camps for children with chronic or terminal illnesses. The cookout menu includes barbecued half chicken or pork steak, baked beans, coleslaw, bread and a soda or bottled water for $10. Food is delivered or can be picked up between 10:30 a.m.-2 p.m. at 215 N. High Street. Orders can be placed by calling 636.328.5099 or by emailing Ralph Cupelli at rcupelli@truman.edu. SeriousFun Camps were founded by actor and philanthropist Paul Newman, a Phi Tau alumnus. They provide multiple one-week camping experiences for children who suffer from chronic and terminal illnesses that require around-the-clock care and frequent hospitalizations. The camps provide these experiences free of charge to children’s families and it is only through contributions that the camps are able to continue. One hundred percent of the profits from Cookout for Kids go to the camps. In the last three years, Truman’s Phi Tau chapter has contributed more than $4,000. Chapter members also volunteer to work at the camps. Since 2012, “Harry: A Journal of Thought and Action,” has featured academic pursuits and innovative endeavors on Truman’s campus, and this semester, the publication will continue to tell stories that are having local, national and global impact in its third edition. Titled in honor of the University’s namesake, this publication serves as the final product of the Communication Department’s news and reporting and feature writing courses. The content is done entirely by undergraduate Truman students under the mentorship of Pulitzer Prize-winning journalist and professor of communication, Marilyn Yaquinto. While the process of interviewing, researching and reporting serves as an educational experience for students, the journal itself invites the entire campus community to join in the interdisciplinary learning process, as stories focused on pioneers in business, industry, government, education and science are highlighted. A subscription to Harry is free and can be requested online here. This summer, junior Taylor Thompson will be joining members of the Pi Kappa Phi fraternity from universities across the country on a 64-day bike ride from Los Angeles, Calif. to Washington, D.C., to promote disability awareness. This 4,000 mile Journey of Hope will be highlighted by dozens of presentations in communities across the nation on the capabilities of those living with disabilities. After cycling for an average of 75 miles each day, the team will take part in special events in which they will present grants to organizations and meet the people they are helping. The Journey of Hope is sponsored by Push America, an organization founded by the Pi Kappa Phi Fraternity in 1977 with the goal of building leaders for tomorrow by serving people with disabilities today. Its members have raised more than $15 million for Push America since its establishment. This year’s effort is committed to raising more than $500,000 in support of people with disabilities, and Thompson has pledged to personally raise a minimum of $1,500 in support of this goal. For more information or to make a tax-deductible donation to Push America, contact Taylor Thompson at 573.225.6407 or tmt1161@truman.edu. 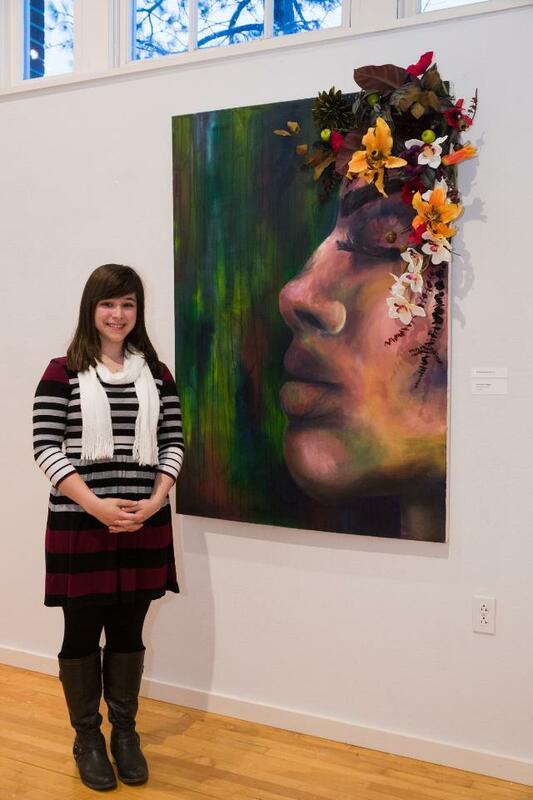 Since 1995, the Student Union has purchased student art from the Annual Juried Student Art Show. 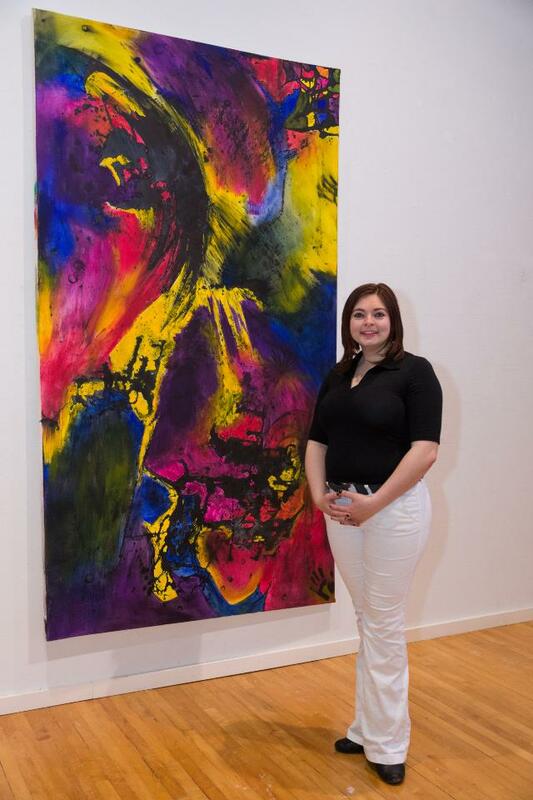 Each piece becomes part of the SUB’s permanent student art collection and is displayed throughout the Student Union Building on a rotating schedule. This year, the student artwork was evaluated and chosen by juror Tommy Frank, a ceramic sculptor from Kansas City. Truman’s Greek Week Committee will be sponsoring the philanthropy event “NickeGLOWdeon Dance-A-Thon” at 7 p.m. April 4 for their annual Greek Week celebration. This year’s theme will be “Glow in Dark 90s” inspired by Nickelodeon. The event will take place on Truman’s Quad, with a rain site of Pershing Arena. It is open to all members of the Greek, campus and Kirksville communities and is intended for audiences and participants of all ages. Children are welcome. The majority of the proceeds will be donated to Kirksville’s Victim Support Services, Inc. Victim Support Services provides services to men, women and children who are or have been the primary or secondary victim of a violent crime including domestic violence, sexual assault, stalking or any type of abuse. Services offered include a 24-hour crisis hotline, emergency shelter, case management, advocacy, counseling, support groups and referrals. Anyone interested in participating should form a team and register online at greekweek.truman.edu. Dancers will be given glow in the dark items to wear throughout the event. There will be music, games, prizes, a costume contest and a lot of dancing. Greek Week at Truman State University is the celebration and promotion of the Greek Life Pillars: scholarship, leadership, integrity and commitment throughout the campus and community. Greek Week is a time for Greeks to give back to their campus and community. The Student Union Reservation Office will accept reservation requests for the fall semester beginning March 31, through April 3, from 8 a.m.-6 p.m. in the SUB Reservation Office, Suite 2000. All requests must be submitted in writing on a reservation form provided by the Reservation Office. Informational packets will be sent out to departments and student organizations the week of March 24. No early forms will be accepted. Additional forms will be available to print on the lottery website. No electronic confirmations for Fall 2014 lottery requests will be provided. Confirmations will be mailed by May 2 regarding each request. Any questions should be addressed to the SUB Reservation Office via phone, 660.785.4186, or email, union@truman.edu. In celebration of earning a 2013 Tree Campus USA recognition, Truman will be hosting a tree planting ceremony and reception at 11:30 a.m April 4 on the grass area on the southwest side of Magruder Hall. The Truman Alumni Association celebrates Truman State University National Spirit Day on the first Friday in the months of April and October. Show your school spirit by wearing purple or Truman apparel. Send us a photo showing your school spirit and receive a Truman coozie and window cling courtesy of the Truman Alumni Association. Upload your photo here or email it to Bulldogforever2@truman.edu. This annual tradition began in Missouri Hall and has now expanded to welcome all on-campus residents. This glow-in-the-dark dance party will feature music by Joe Wright, aka DJ #TurnWrightHere. Everyone is encouraged to wear colorful clothing. All are invited to join the Missouri Hall Student Advisors by the bell wall from 1-3 p.m. on April 3 to decorate their white shirts with glow paint. Donations will be accepted for the March of Dimes Foundation, helping premature babies and their mothers. Baldwin Hall 176 (Little Theater). This full-length feature documentary from Brave New Foundation, director Robert Greenwald investigates the impact of U.S. drone strikes at home and abroad through more than 70 separate interviews. Professor Lawrence Wilkerson is the Distinguished Visiting Professor of Government and Public Policy at the College of William and Mary in Williamsburg, Va. Before his decade at William and Mary, he served 31 years in the U.S. Army, including as special assistant to Gen. Colin L. Powell when the general was chairman of the Joint Chiefs of Staff. He was also Powell’s chief of staff when Powell was Secretary of State. His remarks will address Unmanned Aerial Vehicles (UAVs)—the technology, the cultural impact of their use, the ramifications for international and domestic law, the strategic, operational and tactical dimensions and the effects on the warrior ethic of the U.S. Armed Forces. Both events are sponsored by Society and Environment, the School of Social and Cultural Studies, the Cultural and Societal Honor Society, Multicultural Affairs Center and the Department of History. Upward Bound has paid positions open in the following areas: Spanish instructor, anatomy instructor, freshman tutor, residential mentor, yearbook advisor and photographer. Application materials and more information are available at ub.truman.edu or by calling 660.785.4244. Remember to file the 2014-2015 Free Application for Federal Student Aid (FAFSA) located at fafsa.gov to determine Title IV federal aid eligibility (Pell Grant, SEOG, Perkins Loan, Work Study, Stafford Direct Loans, PLUS Loans). FAFSA results are also needed for some other federal, state, University and private programs. The state’s FAFSA filing deadline for the Access Missouri Grant Program is April 1. Do not delay due to late tax filing-the FAFSA allows the use of estimated information–just update the FAFSA record after the 2013 income tax figures are finalized. Later FAFSA filing may result in more limited funding options. For questions, contact the Financial Aid Office, McClain Hall 103, or 660.785.4130. The Truman Public Relations Office is now accepting applications for the full-time fall 2014 internship position. To apply, send a résumé, two writing samples, copies of advising transcripts and contact information for two on-campus references to the Public Relations Office, McClain Hall 202 no later than April 4. For questions about the internship, contact Travis Miles at tmiles@truman.edu. Basic Life Support (BLS) courses, taught by Liz Jorn and Jana Arabas of the Department of Health and Exercise Sciences, are designed to help people recognize and respond to several life-threatening emergencies, provide CPR, use an AED and relieve choking in a safe, timely and effective manner. Payment: Participants can pay their registration fee with a check (made out to Truman State University) or cash at the Truman State University cashier window on the first floor of McClain Hall. April 18 - 7:30 a.m. to 10 p.m.
April 19 - 1 p.m. to 8 p.m.
April 20 - 1 p.m. to 8 p.m.
April 21 - 3 p.m. to 10 p.m. In case of emergencies, call 9-1-1. To have an officer dispatched to contact you in a non-emergency, call 660.665.5621. Lilly Barlow, a senior sociology/anthropology major, had her essay chosen by the Vice President for Academic Affairs Office to forward to the Council of Public Liberal Arts Colleges (COPLAC) as Truman’s submission for the David J. Prior Award contest. The David J. Prior COPLAC Award will recognize two senior-level undergraduates whose academic careers and future goals have been shaped by the liberal arts and sciences experience at a COPLAC institution. Senior men’s basketball player Mike Carlson was named the sixth all-American in program history. The Great Lakes Valley Conference co-Player of the Year was chosen to both the National Association of Basketball Coaches (NABC) and Daktronics all-American teams. Sarah Glenski, senior Spanish major, has been chosen by the Truman chapter of Phi Kappa Phi to be nominated to the Honor Society for the PKP Graduate Fellowship. Tara Harrison, a sophomore justice systems and psychology major, was chosen to have her review of “Criminology” by Frank Schmalleger published in the International Journal of Criminal Justice. Her review will be featured in the January/June 2014 issue. Free body composition assessments will take place at the Student Recreation Center from 10:30 a.m.-1 p.m. and 4-5 p.m. March 31, as well as from 2:15-3:45 p.m. April 3. Tests include measuring body fat percentage, blood, pressure, waist-to-hip ratio and body mass index. Sign-up at the weight room desk. The Truman Facuty Forum will sponsor Jerrold Hirsh, professor of history, as he presents “FWP 2.0: Is a 21st-century Federal Writers’ Project Possible?” at 7 p.m. April 2 in Baldwin 156. Hirsch will explore the renewed interest in the New Deal’s FederalWriters’ Project since the economic implosion that began at the end of 2008. This renewed interest reflects seemingly permanent questions about American culture and nationality, and about a perpetual need to rediscover a diverse pluralistic America. Refreshments will follow the talk. Truman’s Environmental Studies Conference, “From Local to Global: Mapping Out Environmentalism” will take place from 10 a.m.-5 p.m. April 5 in Violette Hall 1000. The conference will feature presentations from an array of disciplines exploring the diverse and evolving connections between humans and the environment. Faculty, staff and community members are invited to attend. Hosei University in Tokyo is offering a “Japanese Language Program” for Summer 2014. The cost of this program will be $1,075 which includes the program fees and accommodation. To apply, contact the Study Abroad Office at ciea@truman.edu and submit an application before April 7. The Missouri London information meeting will take place 4-5 p.m. April 10 in the Student Union Building 3202. Mustafa Sawani, professor of economics, will discuss studying communication, politics, business, history and a variety of other subjects while living, learning and interning in the capital of the United Kingdom. The Missouri Insurance Education Foundation will award scholarships to deserving students attending Missouri colleges or universities in a program that could lead to positions in the insurance industry in Missouri. The C. Lawrence Leggett Scholarship in the amount of $2,500 is to be awarded to a junior or senior Missouri resident majoring in insurance or a related area of study in a Missouri college or university. In addition to the Leggett Scholarship the foundation has made an additional scholarship available in the amount of $2,000. Application forms are available at mief.org and are due by March 31. The Scholarship Foundation of St. Louis is a non-profit organization that provides access to higher education to St. Louis area students through interest free loans. The program assists students with financial need. Applicants must have a minimum cumulative 2.0 grade point average, demonstrate good character and must be a permanent resident of: St. Louis City; St. Louis County; the Missouri counties of Franklin, Lincoln, Jefferson, St. Charles, Warren or Washington; or the Illinois counties of Bond, Calhoun, Clinton, Jersey, Macoupin, Madison, Monroe or St. Clair. Applications are due April 15. For more information, call 314.725.7990 or email info@sfstl.org. The Jack J. Isgur Foundation will award 15–30 scholarships to students majoring in education at four-year colleges who have indicated a desire to teach humanities at the elementary and middle school levels, particularly in a rural district in Missouri. Scholarships can be as much as $2,000 and are available to juniors and seniors in undergraduate college, as well as to graduate students. For more information and to obtain an application for this scholarship, go to isgur.org. Deadline is May 15. The BigSun Organization is offering a $500 scholarship to help a student athlete succeed in academic pursuits. All student athletes are eligible, regardless of which sport they are participating in. Visit bigsunathletics.com to learn how to apply. Deadline for submission is June 20. The Sonoma County Satellite will offer two $500 scholarships for the Fall of 2014 to the students who submit the best essays based on one of the three prompts listed on their website. Entry is free an open to all current and prospective students who are enrolled in nine or more credits at an accredited U.S. college or university. More information about the application can be found here.